Modern E/E engineering environments can be used to model diagnostic communication over CAN and automotive Ethernet, simply and quickly, with the help of the UDS and DoIP protocols including routing via diagnostic gateways. This article describes how you can use Vector's E/E development solution PREEvision for AUTOSAR-conformant vehicle diagnostics over DoIP. The electronically controlled systems of modern vehicles are networked with one another to a high degree, and they execute many complex functions. 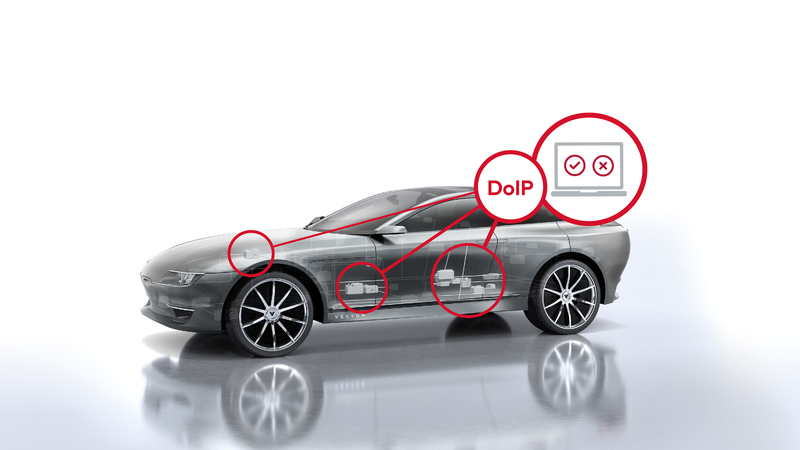 The communications protocol DoIP (Diagnostics over Internet Protocol) – which is supported by AUTOSAR – enables flexible and powerful diagnostics of systems over Ethernet, WLAN and mobile data connections: both offboard in the workshop as well as onboard and via remote access during the drive. The same applies to flashing of ECUs in manufacturing, in the workshop or over-the-air. For this to work properly, it is necessary to define the communication paths between the diagnostic tester and the specific diagnostic object (device under test or DUT) of the vehicle network precisely. It is essential to use the right tools to find optimal paths in a modern vehicle’s complex Electrical/Electronic (E/E) network.